30 Days of Coffee: Day 4 | Eat. Go. Learn. Live. Formerly known in LA for wholesaling their beans to local brewers, Verve has finally settled in dtla’s fashion district. Originally from Santa Cruz, this coffee roasting company sources its beans from all over the world, and makes it their own in their roasting and brewing techniques. You can really taste the extra effort! 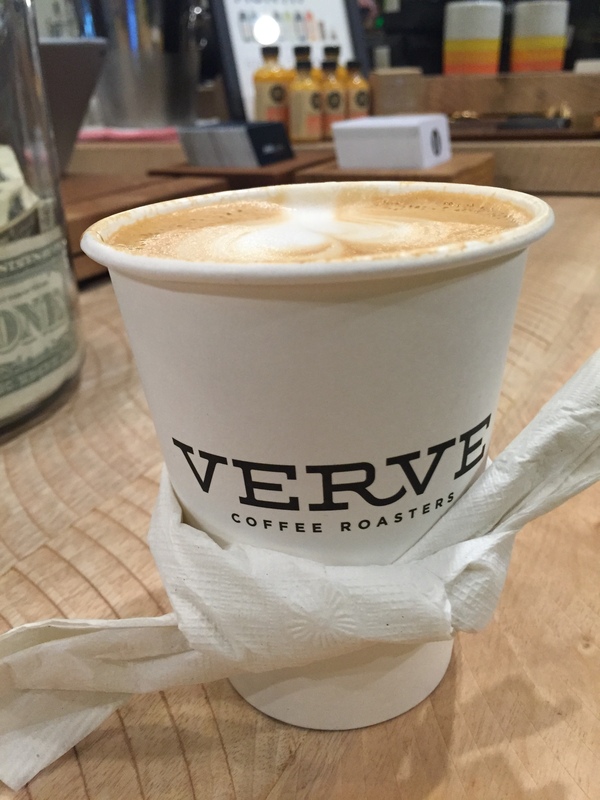 When I finally got my chance to experience Verve, my barista somehow convinced me to try a vanilla latte (I never order those), but since it was comped I decided to go for it. It wasn’t bad, just not my normal thing. Every time after that has been my usual regular latte though. 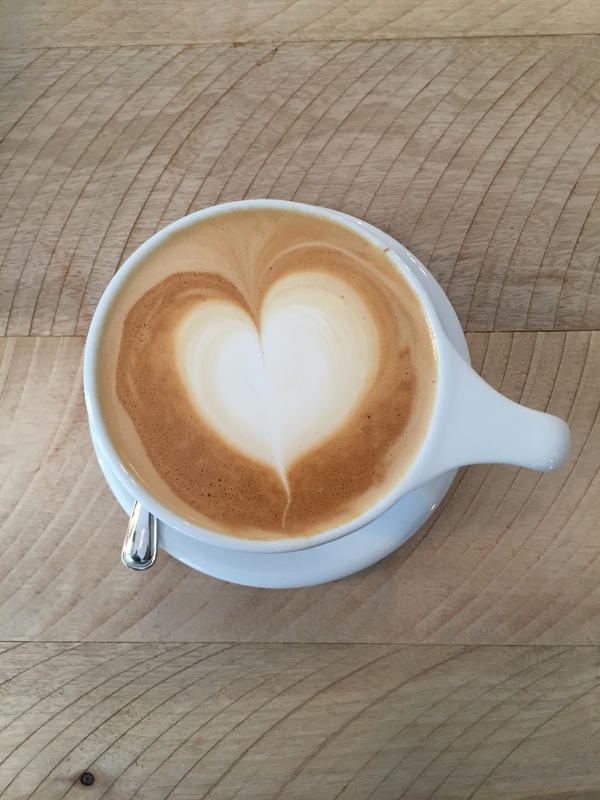 I love my lattes! You can never go wrong with a well-made regular latte, imo. My favorite latte from Verve was made by barista Jordan. The cup was pretty hot for me to hold, and I didn’t notice any cup sleeves. In stepped Jordan with his oh so innovative mind, and creates the perfect napkin sleeve for me. It was so adorable, and looked like my latte was dressed for a formal occasion with a bowtie (#blacktiecoffee)! Thanks Jordan! It may be the “LA” in me, but I was also really excited to see that Verve has teamed up with Juice Served Here! I know they’re a little pricey, but when you really need a cold-pressed juice to-to it’s so great to have them around. They even offer juice flights so you can get a taste of a variety of their juices. I really like the Hot Lei, and the Tres Leches (not in the flight). 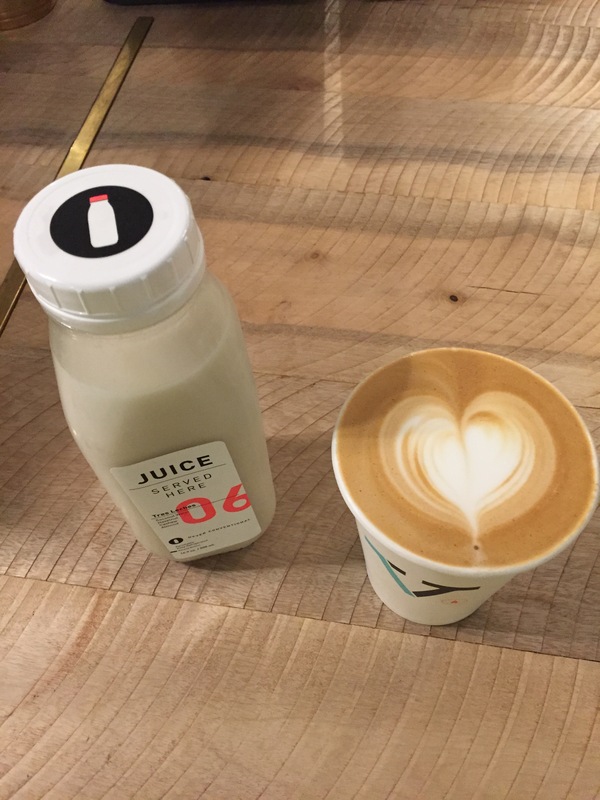 They also make lattes with some of the milk drinks from Juice Served Here and frozen juice treats (get some for the kids)! The space inside Verve is straight-edged, but still very social. At the counter there’s a nice sized pastry display, a couple of automated drip coffee makers, a huge Kees Van Der Westen espresso machine, and the two menus on the wall. The colors are mute (stone and wood), with plenty of natural and artificial light. There is a long bench-seat table and bench seating along the wall. A small shelf filled with retail items separates the service counter from the seating area. It feels like a typical LA workspace to me. Outside is much different, however. The semi-enclosed patio area is walled with bright green plants and the seats are a warm, dark wood. The rounded tables seem a lot more cafe-like (and appealing) to me. The overhead lights are hidden among hanging plants. I’d much rather sit outside, especially on a sunny day. 30 Days of Coffee: Day 19 | Eat. Go. Learn. Live.